A drawing of the old church of Llanerfyl in Montgomeryshire, Wales, dating from before 1870 when the building was demolished and replaced by the present structure, shows a huge and spreading yew tree in the churchyard. Beneath the tree can be seen what is now known to be an early Christian grave marker. (The stone has now been taken into the church to prevent erosion.) It was long thought to mark the earthly resting-place of St Erfyl, but this is now known not to be the case. Although much worn, the inscription has been interpreted to reveal that it marked the grave of Rustica, the thirteen-year old daughter of Paterninus. The inclusion of the word ‘peace’ in the inscription tells us that Paterninus and his daughter were Christians. 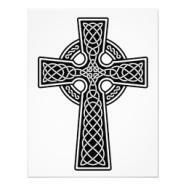 The stone has been dated to the 5th or 6th Christian centuries, and shows us that there was a Christian presence here by that time. That fits well with the presumed dates of the life of the church’s patron, the virgin St Erfyl, who is believed to have settled here in what was then a remote and peaceful spot for a life of contemplation and prayer. What is exciting about Llanerfyl is the survival in the church of two remarkable pieces of woodwork, both dating from the 15th century. 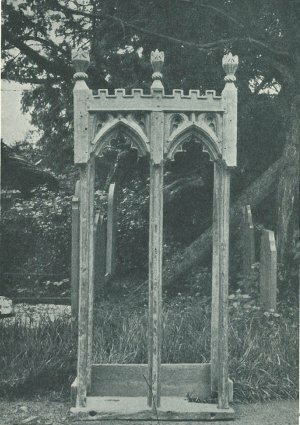 The first is the skeletal remains of an elegant canopied shrine, which no doubt formed the centrepiece of the altar. In the base are two mortice-holes, which once anchored statues. One would have been of the Theotokos and Child, the other of St Erfyl. It is clear that the shrine originally had a pair of doors, which would have had painted panels depicting the lives of the Theotokos and Erfyl, and which would have been closed during Great Lent. Neither the statues nor the doors have survived. 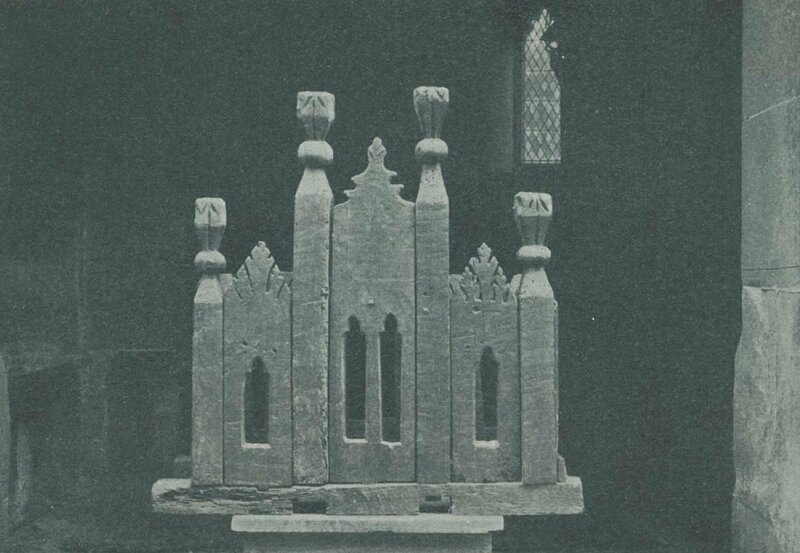 The second item is a reliquary, carved in the shape of a church. This would have contained the casket which housed the relics of the saint. The reliquary thus formed a tabernacle – what was known as a capsula reliquiarum – and this would have been carried in processions. The slots for the carrying-poles survive. These two items of sacred furniture vividly evoke the days when the Holy Virgin and St Erfyl were venerated locally. As with so many early Christian sites in Wales, there was a holy well nearby. It has now dried up, and its stone arched canopy has disappeared. For many centuries the water from the well was used for all baptisms in the church, and on the Sunday after the feast-day of St Erfyl (variously the 5th or 6th July in the old calendars) and on Easter Monday the youth of the community gathered at the well to drink of the waters, sweetened with sugar, and then enjoyed a picnic and dance in the field surrounding. There are several variant spellings of the name Erfyl. One is Eurfyl, and it has been suggested that this means “she of the golden lips”. Are there echoes here of the saintly John Chrysostom, the “golden tongued”? 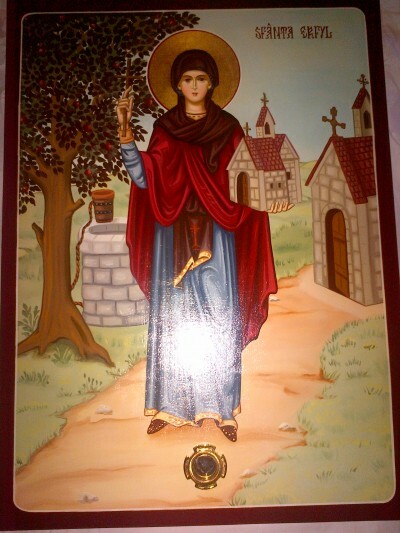 The church of the Three Hierarchs and St Cybi here in Lampeter houses a Holy Icon containing a relic of St Erfyl. There is an early 20th century stained-glass window in Llanerfyl Church depicting the saint, holding a model of the church she founded so many centuries ago. Holy Erfyl, pray for us.